The clothes you sell have been directly linked to devastating air and water pollution at viscose factories in Asia. As customers across Europe, we demand that you immediately commit to a zero pollution policy and timeline, work with producers to transition to clean technologies, and stop purchasing from producers who fail to comply. Viscose, a common textile in the clothes we wear, is often produced using dangerous chemicals that are being dumped in lakes and rivers, and pose a health risk to workers and locals. So the WeMove community mobilised in the hundreds of thousands to demand they clean up their act. But big firms like Primark, Mango and Topshop are still either declining to disclose whether they use dirty viscose, or still haven’t committed to stop sourcing it. Viscose is a plant-based fibre that’s an increasingly popular alternative to cotton or synthetic products. It’s often pitched to consumers as a more “sustainable” option — and it could be. But the viscose European fashion giants are buying is anything but sustainable. It’s the result of a chemical-intensive process with no real environmental controls. That means factories release far more dangerous chemicals and noxious gases than recommended levels. Investigators who visited Asian factories where viscose is produced knew straight away that something was seriously wrong. These factories could be devastating local environments and communities. At factory after factory, workers and local residents told investigators stories of sick friends and family, undrinkable water, and devastated fisheries. Residents at one factory in China said that they didn’t even dare to feed the dead fish to their pigs due to the levels of contamination. Water quality tests backed these stories up. It doesn’t have to be this way. Clean production technologies already exist and can be implemented. European fashion giants are some of these factories’ biggest customers. If they demand changes, the factories will have to act. It is a human right to have clean Air and Water for all. Protecting the health and safety of human life should be one of the highest priorities for any manufacturers over profit. These pollutants should be banded. I don't want fashion at the cost of other peoples or the environments health. When cleaner ways exist, it should be a crime if you do not use them. The WeMove community is here to stand up against corporate greed that damages the environment and our communities, in Europe and elsewhere. To stay independent, we are very careful about who we accept money from - but impactful campaigns need funding, so we need your help! Can you donate just a few euros a week to help our community to fight againt devastating local environments and communities? You and I like fashion, but what if fashion was to cause pollution in rivers and sickness to people? 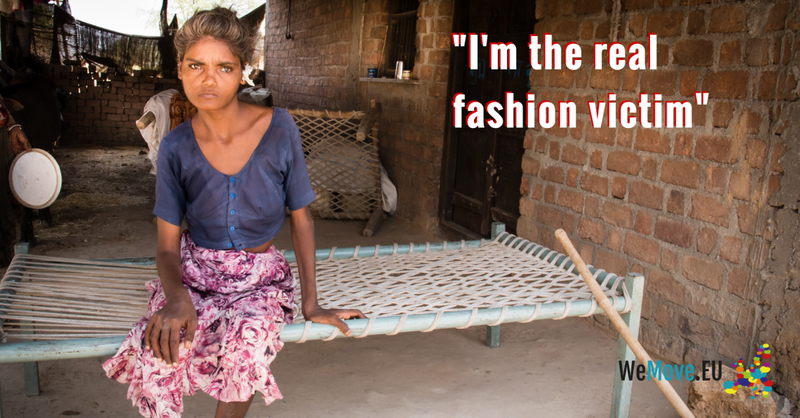 It doesn’t have to be that way: SIGN now to ask fashion giants to commit to safe clothes production! Thank you for taking action with us against fashion giants devastating pollution in Asia. Help us have maximum impact with this campaign -- share it with your friends and family!